Sony points out Nintendo and Microsoft's flaws - or, in crazy ex-girlfriend style, asks "what do they have that I don't have?" The worst kind of public relations is to attempt to point out the flaws of your competitors, instead of concentrating on promoting your own strengths. Sony has been shockingly guilty of committing this PR sin at CES 2009, issuing a press release pointing out the weaknesses of Nintendo's Wii and Microsoft's Xbox 360, in comparison with the (admittedly) feature-rich PlayStation 3. "Sony sent out a press release that attempted to set the tone of the console debate," wrote Wired's gaming correspondent Chris Kohler this week, adding, hilariously: "Apparently this year's tone will be "crazy ex-girlfriend"." The reality of the situation is that PS3 sales dropped in the US in November, compared with the same month in 2007 and, as Kohler points out, with "a $200 entry-level Xbox 360 attracting price-conscious shoppers, Sony is gearing up to take a beating in December, January, and beyond. "So out comes the spin. First, a Sony exec tells CNET that PlayStation 3 sales were up 130% following Black Friday, which is somehow supposed to be a sign of health even though sales of every product on Earth jump after Black Friday." Sony's release continues: "The Xbox 360 and Wii offer a set of features in their own right. However, when you take a look at the feature offerings side by side, there is only one true winner in delivering total value and price." 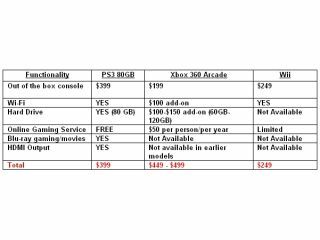 The console manufacturer then offers journalists the handy feature comparison chart you can see to the right here. Then Sony makes the fundamental mistake, stating: "The Xbox 360 requires additional money, multiple upgrades and additional external devices, putting a burden on the wallet and adds clutter to the entertainment center. And the Wii's lack of enhanced features comes at the expense of a comprehensive entertainment solution. So as PS3 continues to evolve without the need for additional parts or expenses, expect the competition to continue peddling add-ons in an effort to keep up with the Jones'. Or, as Wired has it: "In other words: what does she have that I don't?!" Is Sony grasping at straws? Is the PS3 era coming to an end? Let us know your thoughts on this below.